We spent a day last week in the Temple, and we’ll spend another day there this week. How could we have done this since the Temple isn’t built yet, and Burning Man hasn’t even started? 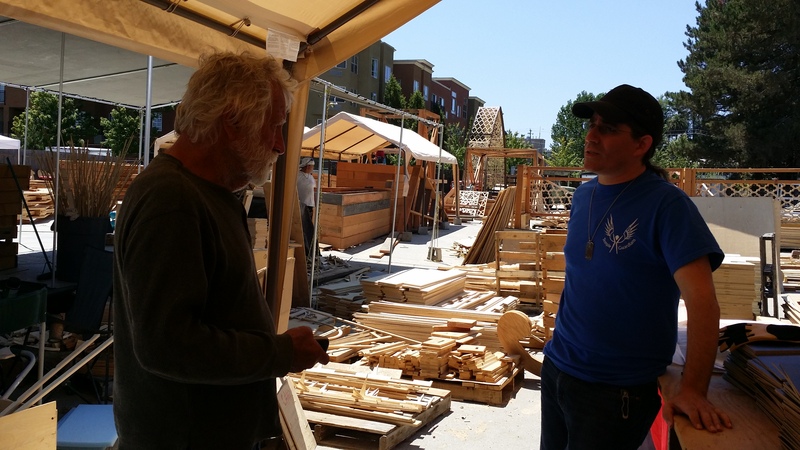 Our time was spent at the Temple build site in Petaluma, doing our best to help pull together the thousands of piece parts that will be shipped to the Playa for assembly into a new David Best Temple. We’ve always felt inspired when entering the Temple, and we had a similar feeling walking into the work site. Despite the legendary heat of interior Northern California’s summer, a bevy of volunteers were buzzing around the worksite shaping the detailed elements that would go into the temple, packaging them for shipment, and loading them onto the 18-wheeler that will be heading out to the Playa just a few weeks prior to the Burn. Most of us were just doing grunt work – carrying finished pieces to packing areas and then covering them with shrink-wrap. But there were plenty of experienced engineers and skilled artisans on-site as well, and a leadership team that is needed to ensure that this complex project comes to fruition. One of the great things about working on the Temple was seeing some of the detail work close-up. Delicate wooden spirals, miniature spires and multi-faceted wooden stars were everywhere. I wondered as I looked at them whether I would have even noticed these details if I had entered the finished Temple without seeing it in pieces. I’m certain I would have missed some of them, but now I’m equally certain that I’ll see every one. Working on the Temple, meeting its designer, architects, engineers and artists made me feel like part of what’s called the “Temple Crew.” It didn’t hurt to be thanked personally by David Best for our participation. Now, I can’t wait to get back to Petaluma to see and do more. And working on the Temple raised my level of anticipation and excitement for Burning Man 2014. Thanks to everyone who is creating this year’s Temple, and thanks for letting us unskilled volunteers feel like part of the process. And if you want to know more about Temple Guardians and the role they play in “holding the sacred space” for all of us Burners, check out the new film, Dear Guardian at http://www.ianmack.com/dear-guardians/.